Has the Guardian gone back to the bad old days of accusing Israel’s blockade of poisoning children in Gaza – Victoria Brittain’s infamous 2009 “blue baby syndrome” article? With a picture of three newborn babies at the top of an article in the Guardian, headed “Bitter Palestinian rivalry adds to the agony of Gaza’s vulnerable” I anticipated a report by Sarah Helms, “a former Middle East correspondent and diplomatic editor of the Independent”, that described the effects on children in Gaza of the deadly internecine struggle between Fatah and Hamas for control of Gaza. However, given Helms’ background, for example her Corbynesque enthusiasm for Hamas, the article takes a very different tack. While describing how the PA and Hamas are causing the suffering these children and others are experiencing, Helms repeatedly hints and states that the suffering of these children is due to the Israeli blockade, and hence, Israel. The truth is very different. To briefly recap the situation: the PA is using every means at their disposal to make life in Gaza unendurable in order to topple Hamas. Hamas fights back by taking actions that allow it to blame the PA and Israel for its failings. The PA’s controls the funding “Palestine” (i.e., the PA) receives from foreign donors – the EU, USA and others. As Helms writes, “[PA President] Abbas – who also hates Hamas – added to the Gaza Strip’s misery by regularly starving it of overseas aid, which his authority administers because of a boycott of Hamas by the international community”. The PA does more than that. It directs salaries solely to its faction in Gaza, it refuses to pay what it owes to Israel for the supply of electricity from Israel and fuel to run the Gaza power station, and it refuses to allow unimpeded flow of critical medicines into Gaza. For its part, Hamas does its best to enforce its rule through such tactics as using internal terror to control the the population, and, relevant to the plight of new-born babies and other Gazans needing medical treatment, diverting supplies that Gaza receives to military and factional purposes, and, not least, by controlling which Gazans it will allow to cross into Israel for medical treatment and to take part in such activities as attending conferences. As one reads Helms’ article, one encounters contextless references such as “electricity virtually cut off, “A blockade, military and economic, imposed by land, air and sea, was first imposed by Israel 11 years ago to isolate and weaken Hamas”. Helms does not explain that the electricity is “cut off” because the PA, controlling the purse strings, refuses to pay Israel for the electricity it would and could supply to Gaza to ensure an uninterrupted electrical supply. Even leaving aside the question of whether Israel should supply electricity to Gaza at all, given Hamas’ avowed intention to destroy Israel, it is simply unreasonable to expect Gaza to receive electricity without paying for it. Israelis pay for electricity, and so should the Gazans – if the PA, which controls the money, would give them the wherewithal to do so. In a disturbing new twist, the offensive bringing misery to the two million people who live here, most of them refugees, has been triggered by the Palestinian leadership in the West Bank, in collaboration with Israel. Presumably in her mind, the PA is unable to contemplate actions that would “bring misery” to Gazans without collaborating with Israel. They are, one must assume, very short of ideas in Ramallah. Nowhere is the new intensified stranglehold more painful to observe than on the wards of Shifa. During the 2014 war, which killed more than 2,300 Palestinians, including about 500 children – leaving 1,000 permanently disabled – the beds were full of the injured. Today the doctors are struggling to save lives not damaged by bombs but by the impact of the blockade. Given the tons of food, clothes and other items transferred into Gaza every day from Israel, this may well be the worst blockade in history. Clearly, medical supplies – and equipment that could not be dual purposed for terrorist purposes – have been and could continue to be transferred into Gaza in required quantities if the PA would allow it. UK Media Watch has repeatedly corrected claims that Israel does not allow medicines into Gaza, or permit Gazans to exit Gaza for medical treatment, or doctors and others to attend conferences. Thousands of tons of medical supplies arrive in Gaza each year. Further, more than 25,000 Gazans are granted permits annually to receive medical care in Israel, the West Bank or Jordan. The only restricted items are weapons and ‘dual-use’ items, those putatively civilian items which can be used “for the development, production, installation or enhancement of military capabilities and terrorist capacities”. Purely humanitarian supplies have never been subject to such restrictions, even during wartime. In April this year, while correcting a report by Gregg Carlstrom in the Times of London which also blamed the blockade for the health problems in Gaza, UK Media Watch noted that even Carlstrom had to admit that “about 2,500 Palestinians and their relatives cross into Israel each month to seek treatment for serious conditions”. A spokesperson for Cogat (Coordination of Government Activities in the Territories) denied that Israel stops Gazan doctors from receiving training. “In 2016 alone, 221 crossings of doctors were coordinated for professional training abroad, whilst an additional 43 were coordinated in 2017,” the organisation said in a statement. “The list of doctors is determined by the Palestinian Authority,” added the Cogat spokesperson. 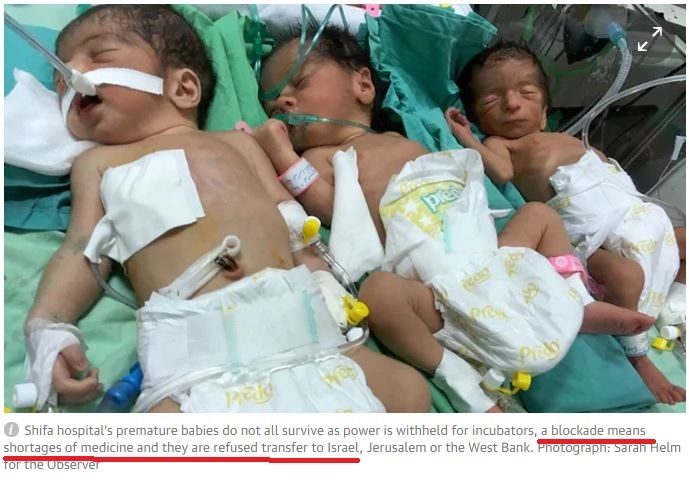 The health of several of the babies is so poor they should have been transferred out of Gaza to modern intensive care units elsewhere, but permission to leave has been refused. Who refused permission? Does she intend that Israel be blamed? Didn’t she herself write that it is the PA which is refusing to pay for the transfer of Gazans to or through Israel? Does she expect that Israel should cover the cost? In the centre of Gaza City, scores of international donors and aid agencies sit in air-conditioned offices. If they are protesting about what they see, nobody is listening. Restricted in their movements for “security reasons”, they see little on the ground and fear to speak out in case Israel bans them from Gaza. How likely is it that Israel would ban these “scores of international donors and aid agencies” for speaking out about what the Hamas are doing? It seems far more likely that Hamas, which “restricts their movements” in order to control their reporting, would make sure that they left promptly? Helms clearly knows this tragedy in Gaza is the result of a deadly internal Palestinian feud, but likely fears being banned from Gaza if she tells the truth. Even worse, she cannot resist seeing the death of babies in Gaza ultimately as an Israeli nail to be hammered even when her own words make it clear where the blame truly lies. It is time for her and others like her to take an honest look at what is going on in Gaza and report truthfully rather than fearing to speak out – not in case Israel bans them, but in case Hamas does. A disgusting, libellous comment from a disgusting, libellous individual. Sure, Mr. Bellamy. And everyone knows that brainwashed Palestinian terrorists do not routinely TARGET Israeli civilians and babies doing such evil things as eating a Sabbath meal, taking a bus, or going to a restaurant, then openly celebrate these vicious murders by passing out candies, with the killers considered “heroes” and getting paid huge sums by the PA. You’re a pathetic liar. Actually, it’s the Guardian and fellow travelers who are killing babies in Gaza by lending support to the religious police state Hamas has constructed. They’re but a bunch of violent thugs. Nazis wearing shmattas on their heads tug at the Guardian’s heartstrings.